What am I eating (in real life again)? : brunch has been deferred. I have this nice glass of water. Any other notes/Status: did you know that my back still hurts? I just thought you might be wondering. So we go to Rome on a once in a blue moon, big time 25th anniversary trip for a month. And that's done, and maybe you're wondering, hey, what's up with New York? It's complicated. There were these 600 dollar tickets from New York to Milan. So we started shuffling things around. Plus my wife wanted to see a show at the Guggenheim of Agnes Martin works. And there was something appealing about having a sort of soft landing in the USA. Rome ends, but the trip isn't quite over. And it isn't! Look at us in this toddling town. We could be heartbroken that it's all over, but it isn't. First we have a farewell weekend in New York. Did I mention it's a toddling town? Well it is, it's very toddling. So our main mission here is to go to the Guggenheim a lot. We are even members at the Guggenheim. If we had plane tickets to Bilbao, in Spain, we could go to the Guggenheim there for free! Instead we are going to the one in New York, but still for free, you know, not counting becoming members. And I like these Alice Martin paintings, sure. They're not natively my sort of thing, reminding me of old accounting ledgers from the fifties. But there is a real presence there, somehow. And they're compelling. There are also some other really good paintings in here. And this Frank Lloyd Wright building is all amazing. But mostly I was interested in the gold toilet. 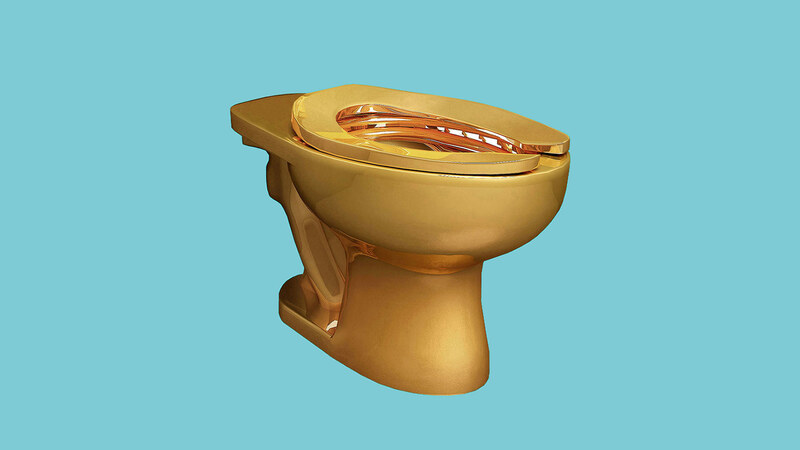 They're installing a solid gold toilet in the Guggenheim, or they were supposed to, but technical problems abounded and it was delayed. Hmph! This sort of thing would never happen at the Venice Guggenheim Museum! Well fine, I don't have to go to the bathroom anyway.